Join the discussion on our forums! Come discuss The Boogeymonster over in our dedicated The Boogeymonster discussion topic. Congrats Boogeymonster. You’re no longer the worst Legendary in the game. 6 drop would be op, 7 drop would be balanced. All they had to do was say "Whenever this kills a minion". 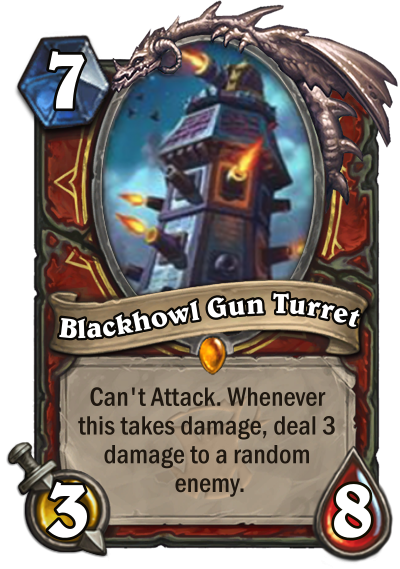 If it doesn't have to attack, and just has to kill a minion, that way your opponent is punished for trading into it at all. That would make it very fearsome indeed. Recently drafted him in Arena. Picked him over Moroes and Auctionmaster Beardo. With Boogeymonster and my Eerie Statue and Silence combo I headed into the arena expecting terrible results. Ended up going 9-3. Still a terrible card, but not absolutely trash-tier in Arena. Maybe if he cost 1-less or had +1/+1 stats he would be decent. Generaly just a worseGruul. It dodges BGH the turn it is played, and might be better with windfury. None the less - toooo slow. 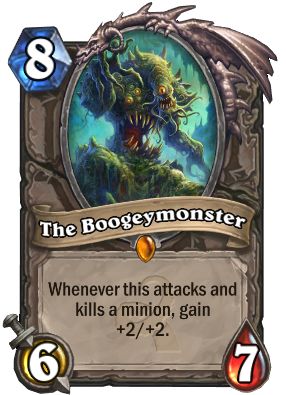 Boogeymonster + nerfed charge combo? Even its golden animation is subpar at best. Monument of corruption and bad design. Um so, i got this guy and i happened to look him up here and, i can see he has 2 play sounds, does anyone per chance know why 2 and how to get the second, would be much obliged if you could tell me and ya, much obliged in advance ;D.
Both play at the same time, one is the vocal portion, the other is the sound effect that happens when you play him. Dust it for 400 mana. Buy an epic, dust that for 100 mana. Buy a rare, dust that for 20 mana. Leave as little a trace you can that this abomination was in your collection. You know not all cards have to be a Dr. Boom or a 7/7 for 4, sometimes it's pretty nice to have something like this with a cool golden animation, some cool quotes and a more unique effect, i'd recommend tryin to play a bit more for fun mate.